Reading and share top 7 famous quotes and sayings about Rearing A Child by famous authors and people. Browse top 7 famous quotes and sayings about Rearing A Child by most favorite authors. 1. "I wonder of what you must daily endure in America, having no government to protect you, no one to tell you what to do. Is it true you're given no ration card, that you must find food for yourself? Is it true that you labor for no higher purpose than paper money? What is California, this place you come from? I have never seen a picture. 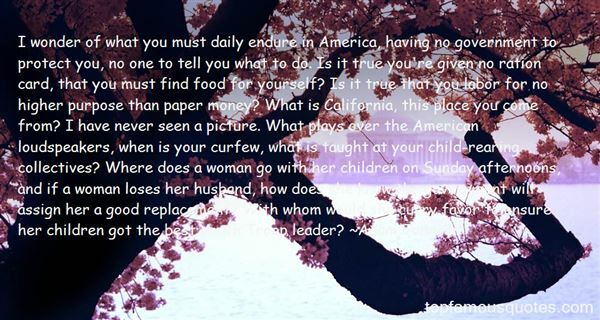 What plays over the American loudspeakers, when is your curfew, what is taught at your child-rearing collectives? Where does a woman go with her children on Sunday afternoons, and if a woman loses her husband, how does she know the government will assign her a good replacement? With whom would she curry favor to ensure her children got the best Youth Troop leader?" 3. "Any woman who has devoted herself to raising children has experienced the hollow praise that only thinly conceals smug dismissal. In a culture that measures worth and achievement almost solely in terms of money, the intensive work of rearing responsible adults counts for little. One of the most intriguing questions in economic history is how this came to be; how mothers came to be excluded from the ranks of productive citizens. How did the demanding job of rearing a modern child come to be termed baby-sitting? When did caring for children become a 'labor of love,;' smothered under a blanket of sentimentality that hides its economic importance?" 4. "With a new awareness, both painful and humorous, I begin to understand why the saints were rarely married women. I am convinced it has nothing inherently to do, as I once supposed, with chastity or children. It has to do primarily with distractions. The bearing, rearing, feeding and educating of children; the running of a house with its thousand details; human relationships with their myriad pulls--woman's normal occupations in general run counter to creative life, or contemplative life, or saintly life. The problem is not merely one of Woman and Career, Woman and the Home, Woman and Independence. It is more basically: how to remain whole in the midst of the distractions of life; how to remain balanced, no matter what centrifugal forces tend to pull one off center; how to remain strong, no matter what shocks come in at the periphery and tend to crack the hub of the wheel." 5. "The greatest duty of mankind lies in the proper uprearing of our children. The fact is recognized, but is the duty fulfilled? 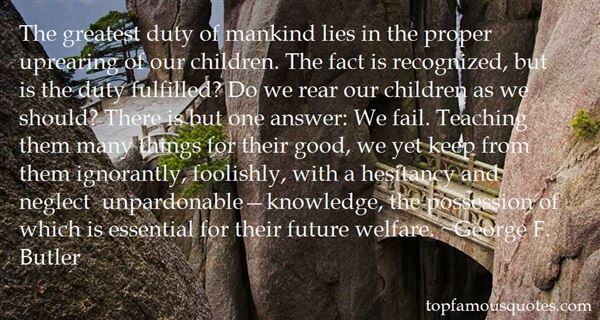 Do we rear our children as we should? There is but one answer: We fail. Teaching them many things for their good, we yet keep from them ignorantly, foolishly, with a hesitancy and neglect unpardonable—knowledge, the possession of which is essential for their future welfare." 6. 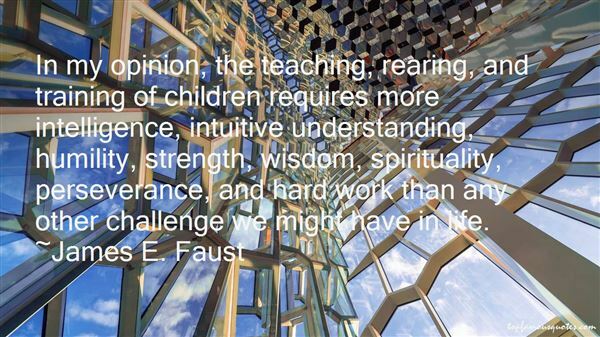 "In my opinion, the teaching, rearing, and training of children requires more intelligence, intuitive understanding, humility, strength, wisdom, spirituality, perseverance, and hard work than any other challenge we might have in life." 7. "Women who work with animals hear this all the time: that their love for animals must arise out of a sublimated child-rearing urge. Ana's tired of the stereotype. She likes children just fine, but they're not the standard against which all other accomplishments should be measured. Caring for animals is worthwhile in and of itself, a vocation that need offer no apologies." Clearly Hamlet wasn't just a fictional Prince of Denmark but also something of an alpha dodo."